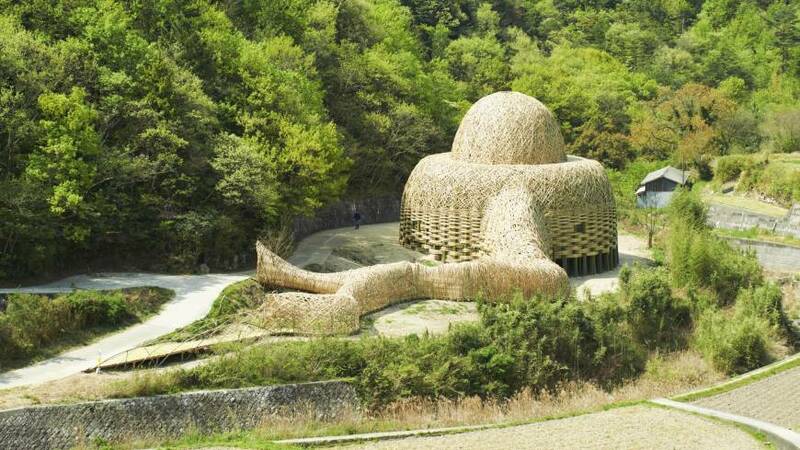 This year more than 150 new artworks are being introduced at the Setouchi Triennale, making a total of around 200 pieces in the islands’ collection. With 12 islands to navigate and many galleries, sites and outdoor installations to visit, conquering the collection seems a formidable task. It would be impossible to see everything in a single trip unless you’ve planned to stay for quite a while, so we’ve selected some impressive pieces that we think deserve a visit. 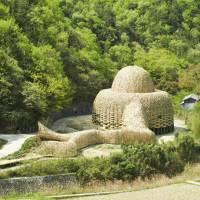 Beginning with the largest and eastern-most island of Shodoshima, a must-see work is Taiwanese artist Wang Wen-Chih’s “The Light of Shodoshima.” Wang, known for large installations using natural materials such as rattan and bamboo, has created a giant dome made up of 5,000 bamboos that were grown on the island. The dome will be illuminated by LED lights at night while during the day, visitors can venture inside to enjoy the patterns cast by sunlight through the woven roof. 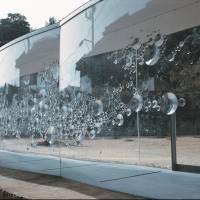 On Inujima, just above Shodoshima, is the Inujima “Art House” project, three galleries developed by Yuko Hasegawa, chief curator of the Museum of Contemporary Art Tokyo, and Pritzker Prize-winning architect Kazuyo Sejima. 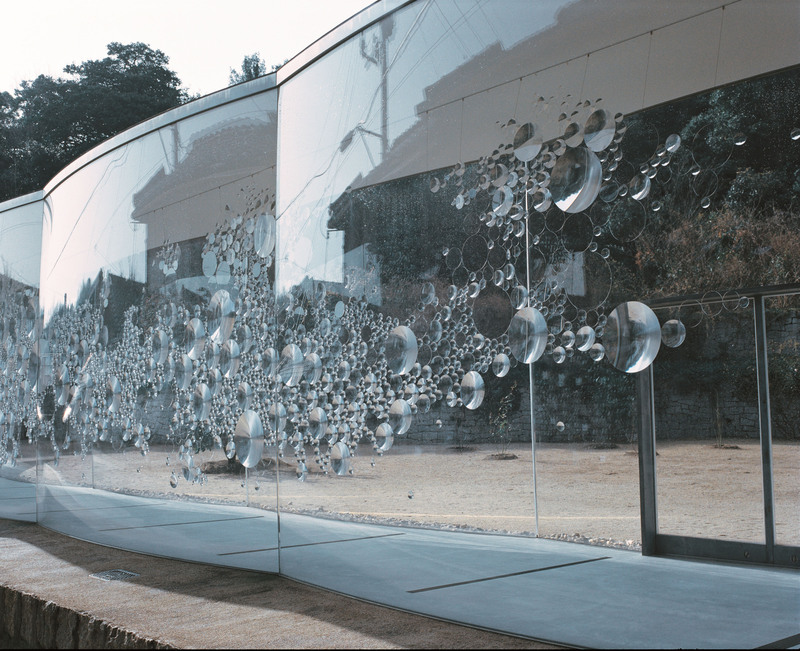 Haruka Kojin, a young visual artist whose large-scale installations often use unusual materials, such as plastic flowers or dried spaghetti, has been invited to showcase her works at two of the “houses.” “Contact Lens,” a wall of large lenses, and “Reflectwo,” an installation made of artificial flowers that appear to be reflected like a large Rorschach test, each get their own dedicated spaces. 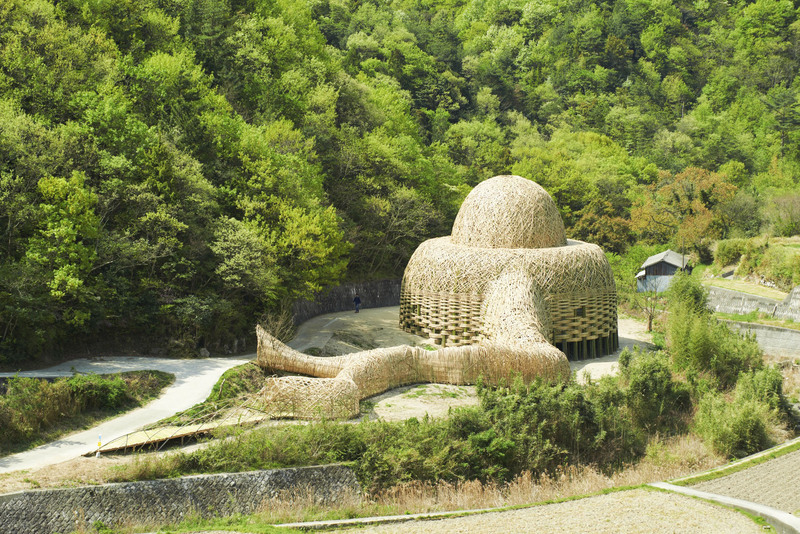 For a more spiritual experience, visit acclaimed architect and youngest recipient of the Prizker prize, Ryue Nishizawa’s Teshima Art Museum on the island of Teshima: a concrete-shell dome shaped like a water drop. Completed in 2010, just after the first triennale, the “museum” is actually mostly an empty space with two wide openings in the ceiling to let in the light and sounds of its surrounding nature. 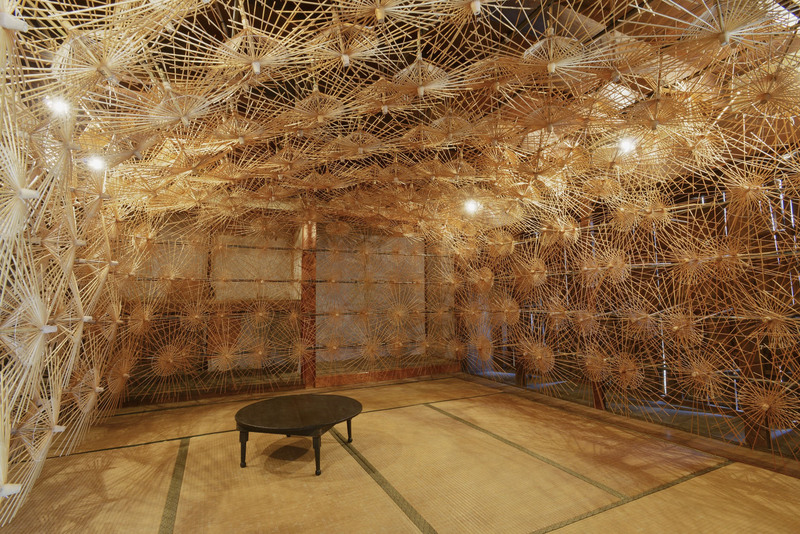 Housed inside is Rei Naito’s work, for which droplets of water seep out of small holes in the floor throughout the day and creep together to eventually create a small puddle in the middle of the dome. Visitors are required to take their shoes off to enjoy the wabi-sabi aesthetic in a truly Japanese way. 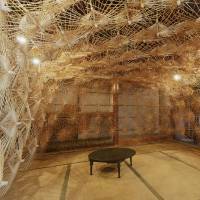 The small mountainous island of Ogijima is displaying Takashi Nishibori’s “Corridor of Time,” a work that covers the entire interior of a Japanese-style tatami room with a spiderlike web created from the wooden frames of Japanese umbrellas — one of Kagawa Prefecture’s traditional products. The 600 umbrella frames are rotated by motors to create moving shadows across the room. 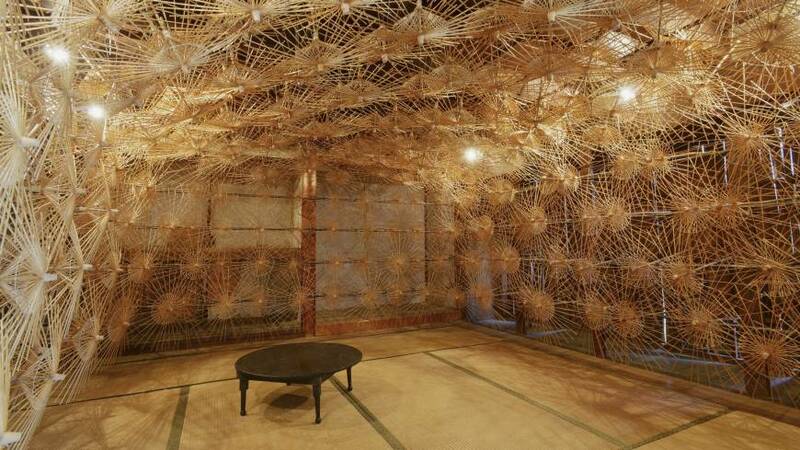 Nishibori also contributed to the last Setouchi festival with a house whose walls were made from the frames of Japanese fans, another traditional Kagawa product. Close by on the sister island of Megijima, you’ll find a dramatic audio-visual sculpture by German media artist Philipp Artus. “Snail Trail” is a laser animation projected onto a cylindrical phosphorous screen, which allows the snail to leave a glowing trail of its movements behind it. 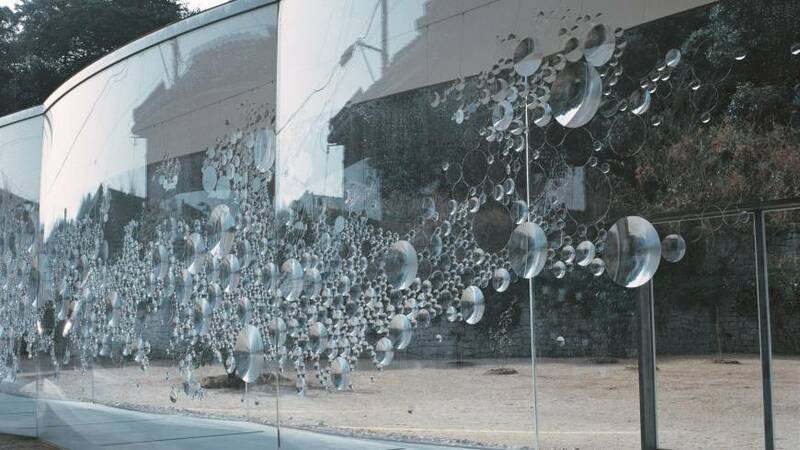 Visitors can watch the animation travel around the cylinder accompanied by an atmospheric soundtrack. Heightening the experience, is the fact that all this takes place in the darkened confines of a cave. At the unusual location of a former leprosy sanitorium on the island of Oshima, artist and picture-book author Seizo Tajima has transformed an old dormitory into the “Blue Sky Aquarium,” a narrative installation illustrating a love story between a mermaid and a pirate. And for our last recommendation, at the westernmost Ibukijima Island, just off the coast of Shikoku, installation artist Ryo Toyofuku collaborates with the Chiba Art School and island locals to create “Unsinkable Ship.” This huge creation made out of hundreds of everyday items, such as fishing tools, is designed to look like a school of fish that weaves in and out of an old elementary school’s classrooms.